The government has rolled out the new electronic vehicle number plate bidding system it said would be introduced this year, albeit three months later than that proposed by the transport ministry. 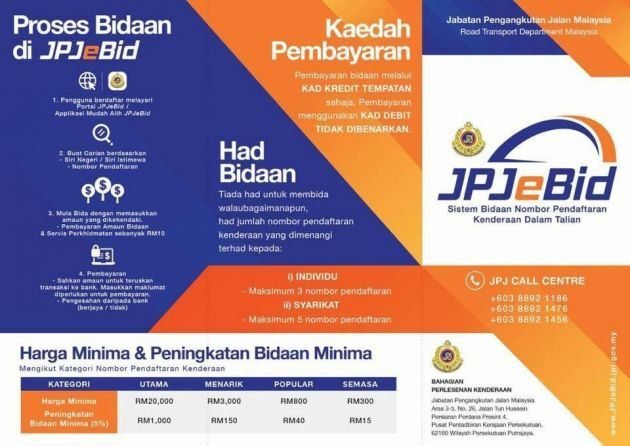 The road transport department (JPJ) began the online vehicle registration number bidding system (JPJeBid) in pilot project form on April 15, kicking things off with the FC plate series. As it progresses, the JPJeBid system is expected to expand its scope to other series plates, though there is no mention of when this will happen and if it will remain only for use with special plates. 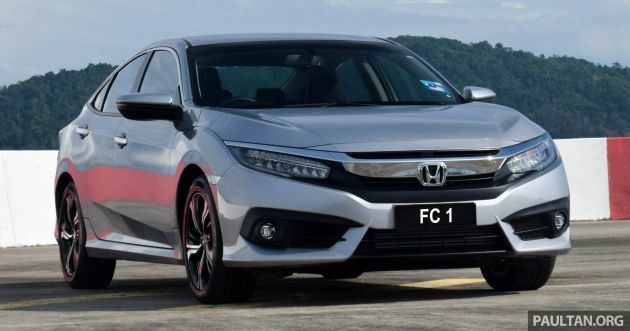 As it stands, the bidding process for the FC plate ends on April 19. A quick check reveals that the system is run under the scope of the department’s existing MySIKAP online transaction system, the feature being listed under the registration number management menu. According to the department, available elements in JPJeBid include advertising, registration, bidding, payment as well as application and account processes. These processes need to be carried out by bidders but will be regulated by the JPJ. The system is open to both companies and public who wish to tender for specific number plates. Registration on the MySIKAP portal is a necessity, and individuals will need to furnish details as well as provide a copy of their identity card for registration purposes. Companies and businesses will have to provide copies of the business registration certificate and licence, among other things, and those not currently on MySIKAP will need to register at JPJ state offices or branches. Once the registration has been approved, users will be able to utilise the e-bidding system through a computer or via a mobile device. There’s a RM10 service charge for each registration number bidder, which will not be refunded, being considered revenue for the government. Each vehicle number requires a minimum payment, with four general categories for numbers – regular (or running), popular (double-digit, certain triple-digit numbers), interesting (matching digits) and primary value (single-digit numbers), with bids starting at a minimum price of RM300, RM800, RM3,000 and RM20,000 respectively. No deposit is required, but each bidder’s first bid amount must equal or exceed the minimum price set in each category. The minimum bid increase is 5% of the minimum price amount by category, with no limit for maximum increase. 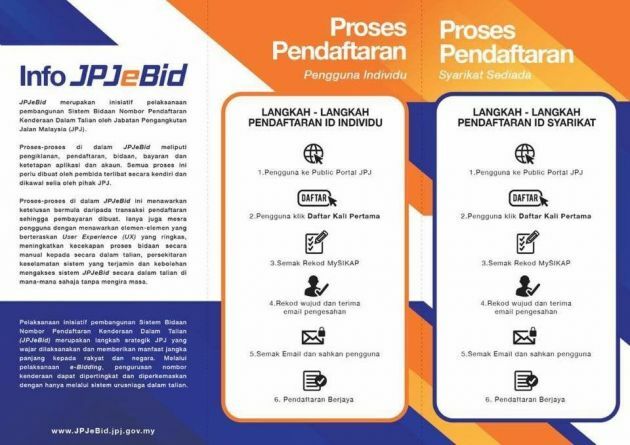 In this case, the minimum bid increase for a primary value number is RM1,000, and RM150, RM40 and RM15 for interesting, popular and regular numbers respectively, and these sums remain constant as a minimum bid increase each time a bid is revised upwards. There is no limit to a bid, but bidders will not be allowed to withdraw their bids during the bidding period. Bidders can only make payments by locally-issued credit cards, with the use of more than one card permissible for the bid. If a bid is successful, the amount will be deducted immediately from the credit card. Unsuccessful bids will see the cancellation of the transaction and the amount credited back to the credit card, with no charges applied. The JPJ says that each individual is eligible to successfully bid for a maximum of three vehicle numbers, while businesses and companies will be limited to five vehicle numbers per series. Bid winners have a period of 12 months to carry out the vehicle registration from the date of the letter of offer given by the department, following which the offer letter will expire and be considered invalid. No extensions – or refunds – will be provided. Those not wanting to take up the number will also not get refunds, so if you don’t use it, you lose it, both number and the money spent. Finally, individuals will be allowed to transfer the successfully bid number to a member of the immediate family, but this will entail providing relevant supporting documents (birth certificate, marriage certificate etc). Companies, however, will not be able to transfer a number before it is registered to a vehicle. What are your thoughts on the new JPJeBid system? Does it hold promise of improved transparency in the bidding process, and do you think it should be expanded to incorporate regular plate series? Share your opinion in the comments section. Bidding but nobody knows what is the winning bid. So still no transparency here. And Rm10 for every bid? Like WHAATTT?! Agree with Jeremy. I tried making a bidding and it keeps prompting that my bid is low and that I should go in with a higher bid. It should be transparent and display the highest bid so we can decide to fight for the number or proceed with our 2nd or 3 choice. Our entire ministry is like a money game scam. We keep putting money in hoping to get something but the only thing we get is utter disappointment. I’ll say better than last time coz need to go to JPJ office once to register MySIKAP before can log in not like before have to go there to pay RM10 service charge every time wanna bid for plate number. 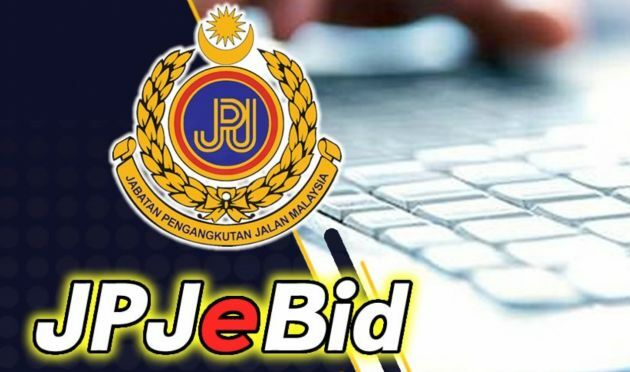 Another plus point is if your bid was unsuccessful there’s no need to call JPJ state office asking them when they’ll return your 50% deposit cheque. Waiting in charge officer to pick up the phone is like forever as if we owe them our money. Do read carefully. The rules of the game are the same. You will still lose your RM10 per bid. You won’t so easily see the money being returned. Not RM10 per bid, its RM10 for each reg number u want to bid for. RM 10 is cheaper than having to drive to JPJ? the refund is refering to the 50% of your bidded amount. ie you bid rm200k cor no.1 you will need to place rm100k in cashier order upon submission. RM10 only be deducted once per bidding registration. As gov charge. While you increase the 5%, there is no other charge. Frankly what is the difference? How many cars do we individually purchase in our lifetime? I notice the party that holds the multimedia ministry is pushing for everything around him to be online. Changing this online does not benefit to public, because we do not purchase it like groceries. Now I know why they keep taking up more and more debt. Penny wise pound foolish. What’s the fuss about it? Have u tried the ebid in the first place??!! Its so dam easy to place a bit to one’s favorite number. Just need to sign-in n start bidding. So dam convenient than having to bid for a number at the JPJ counters itself.. N friend like it or not almost everything revolves directly/indirectly around the digital world, from services, economy, entertainment, education/knowledge, production, security, crime n soon..
Having just tried the ebid for my self, i personally feel it an improvement to the service being provided by JPJ.. Though there are still area’s of improvement over the ebid system (dont now the running bid value for the chosen number) which i hope JPJ would take into account soon, overall thumb’s up JPJ..
Maybe you don’t understand how the present system works. Right now, many people have to go through agents to buy a plate. Go to any Facebook page on “Jual Beli Plate Number” and you can see people making a killing out of it. Yes, fair enough, willing seller willing buyer. But making it online benefits the public because you bid yourself. And yous bid position is updated so if you really want it, when you fall to number 2, you re-bid. Government makes money all the way. In the old system, the agents buy it with their cronies at low prices, and then they sell it at jacked up prices. The money goes to individuals, not the government. I can see that you guys are pushing real hard for the nonsensical system, you guys must be their consultants. Don’t confuse the public, those agents are runners who take large sums but put in little for bids. The original bid system, which has already changed requires the owners to get it themselves. Don’t blame the old system just because you didn’t know or too lazy to go do the bidding yourself. We have a good MYEG system which helps us renew roadtax efficiently (which we need it every year) , I don’t see u guys praising high above of it like you do here? At least this is a new beginning for the number plate bidding system. It is much better than the old system and it is convenience too. The old days JPJ runners and number plate sellers will feel the pain now. Wow, just tried to bid for FC50, the opening bid was RM 800 !! But then i realized there’s no live information shown on the running bid for the FC50 plate !! Serious disappointment, JPJ ru trying to set a money pit trap for potential bidders!! U wan make free free RM 10 for each bidder ka?? Kata transparent system, dont just show the opening bid but instead show the running bid value la n let ppl decide if they wan to bid for it or not.. Stop making cheep money from the Rakyat pocket.. I fully support the move to hide the current bid price. This is not ebay or auction house. I there are disputes after closing, there is always proof coz u can compare your bid to the winning bid. why i register JPJebid account cannot be active one?